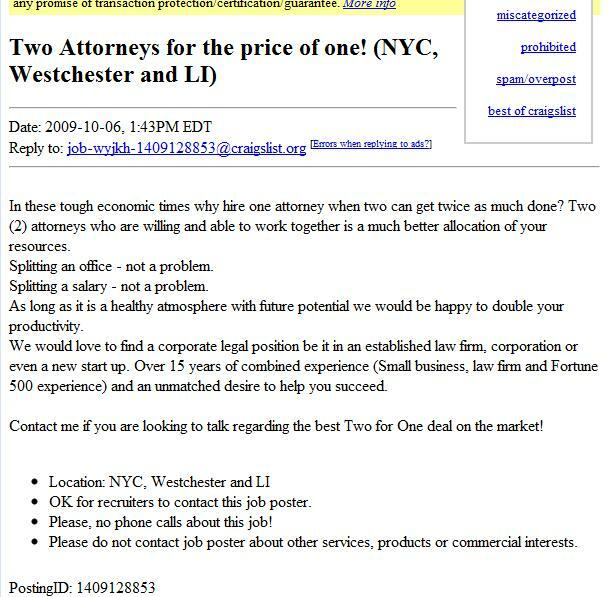 The Jobless Lawyer» Two for One Special! Two heads are better than one and half a pay check better than none! This is what law firms SHOULD be doing to cut costs. Rather than lay people off, just cut salaries! I'm sure most attorneys would rather be making half as much money than be laid off in this economic environment. And the firm would be even more productive! Too bad the geniuses in BigLaw HR departments don't understand this concept. Maybe its just one attorney with a split personality!